The Despatch Module is used to control shipments from the business, so that delivery documents and prompts for invoicing are managed. Comprehensive ‘Picking Lists’ and/or labels are available for checking and ’marshalling-up’ items, that can be confirmed and booked through the keyboard or by barcode. System Reports can be customised with the Company’s logo and header details, to match company stationary. For speed of processing, the module contains a feature to despatch a whole order with one click. Alternatively you can multi-select required lines for despatch. For full control partial despatches of individual lines can also be made. A separate document is produced for every shipment. 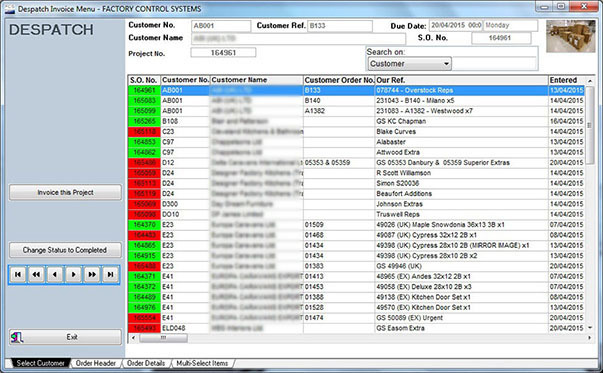 Options are available to automatically manage stock and keep it up to date, including back flushing of relevant Works Orders.